I have good news and bad news. 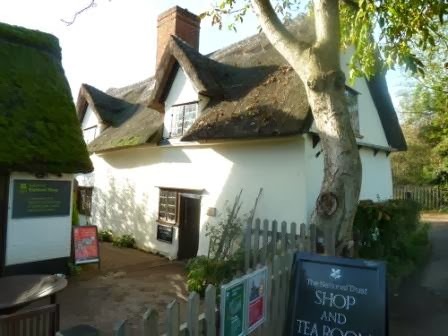 The good news is that today, at Flatford Bridge Cottage in Suffolk, I tasted the best National Trust scones EVER. The bad news is that this means I have accomplished my quest to find the best National Trust scones EVER and I should probably call it a day and end the blog. However, I've decided that Flatford takes special status, because today's scone mission was a mission with a difference. Unlike my other scone trips, I didn't just turn up - Flatford INVITED ME. And not only that - THEY LET ME BAKE THE SCONES. Yes, that's right, today I ACTUALLY BAKED NATIONAL TRUST SCONES. It all came about after my visit to Houghton Mill in September. A very lovely lady called Jemma saw my blog post and contacted me to say that Flatford has its very own SCONE CLUB and would I like to visit? Would I? Readers, I couldn't get there fast enough. I was also very excited because Flatford Bridge Cottage was once the home of John Constable. He produced a lot of drawings and paintings but he is most famous for The Hay Wain, a picture my parents still have on their living room wall. Interesting factoid: Robbie Williams has had The Hay Wain painted onto one of the walls of his LA home, as it reminds him of his nan. I was late getting to Flatford, and although I didn't admit this to Jemma at the time, I was very worried. She had arranged for me to meet the chef and I know that sometimes they can be a little bit temperamental (I was once a terrible waitress in a hotel and the chef threw a cake tin at me). But Russell, the catering manager at Flatford, is quite possibly the nicest, most patient man in the world. 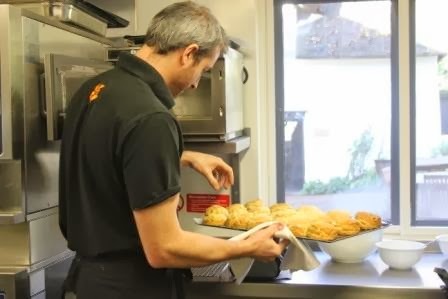 The Scone Club at Flatford was set up mainly for regular visitors, so that there would always be something new for them to try. Russell likes to use local produce and had intended that the walnuts for Scone of the Month would come from the tree by the cottage. However, he was cruelly outwitted by the squirrels, who nabbed all the nuts and left him with just five. 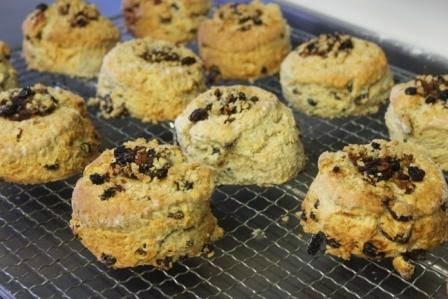 My day then began in earnest with a scone masterclass. Russell explained that scone dough needs very little handling, so once you've rubbed in the butter it's a good idea to use a palette knife to bind the dough together with egg and milk. It's also important to move quickly once you get started, so the baking tray was ready and the oven was on (it needs to be at 190-200 on a domestic oven). Russell then proved himself to be an utter genius and possible reader of minds, by announcing that we were also going to make some MINCE PIE SCONES. I don't think there are three nicer words in the English language. I am probably ruining the surprise for Flatford's regulars but the December Scone of the Month will involve spice, fruit, and a dollop of mincemeat with crumble topping. If you are now salivating and eating the cushions, I'm sorry. I am rarely short for words but I actually cannot express how delicious those scones were. Somehow Russell had got the outside to be really crisp, while the inside was as fluffy as anything. 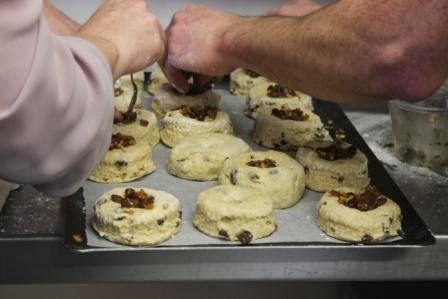 Once Russell has cut all of his scones from the dough, he pulls the remnants together to form a scone that isn't cut but just goes onto the tray with the others. One lucky visitor then gets a scone that is bigger than the others. Unfortunately mine looked more like Ayers Rock, so if you picked that up today at Flatford, I'm sorry. You're probably still eating it. 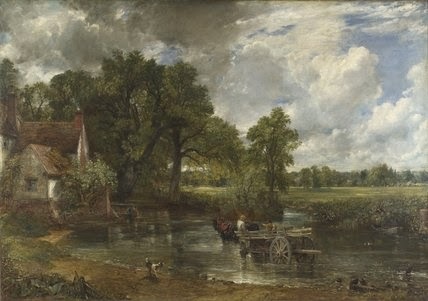 Sarah also told me about how much Constable changed the course of art history - until he came along, nobody had really painted ordinary people in rural settings. He also had quite a sad personal life - because he was an artist, he wasn't allowed to marry his sweetheart until he was 40 and had come into some money. His wife then died of TB only 12 years later. Very sad. But the whole location is breath-takingly beautiful. The Granary along the road, which was once owned by John Constable's father, is now a B&B, and there are walks to other nearby towns. I can't wait to go back and I can't recommend it highly enough. It's a four course scone lunch, basically. I should have written down what was involved as it was so cleverly thought out but I was too amazed to think of it. 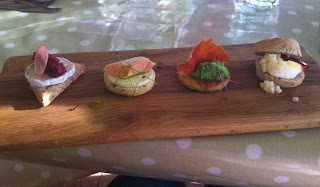 They were all delicious but the drop scone with pea puree and ham, and the walnut scone with quince jelly and mulled apple were out of this world. I could happily eat this for lunch every day of my life. 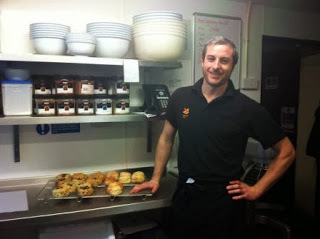 Russell also gave me two bags of our scones to take home, so the Sconesky to my Hutch didn't feel left out. He's eating them now, as I type. So Flatford goes right to the top of the National Trust scone leader board. I had such a fantastic day that I don't think it can ever be outdone. My massive thanks to Jemma, Sarah, Sarah and the very awesome Russell for their time and effort. I highly recommend you follow the East England account on Twitter - https://twitter.com/East_England_NT - and it goes without saying that if you haven't been to Flatford then GO, GO, GO. They're having a Christmas event on 30 November/1 December - as well as Russell's mince pie scones he's making mulled wine so you're frankly INSANE if you don't go along and try some. 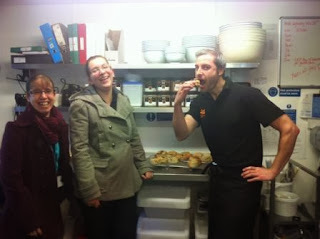 The lovely Jemma, Sarah, and Russell bravely eating one of my scones. got to try every tea room! and then you can go from scones to cake and then to soup!